Here is a list of all the awards that your site may win. Just read the rules for each award and follow the directions for that award. You may apply for more than one award but wait awhile. In order to win any award though you must sign my guestbook and link back. AS OF MARCH 19TH, 2003 NO MORE AWARDS WILL BE HANDED OUT. PLEASE DO NOT SEND APPLICATIONS AS IT IS A WASTE OF YOUR TIME. THANK YOU! 1.You must have a pretty good site with a fair amount of content. 2. It has to be made using real HTML (no easy page builders!). 3. When I first look at it, it should look like you know what you're doing. 4. You must sign my guestbook AND link back to me. 5. Nice design good navigation and that's it for now. 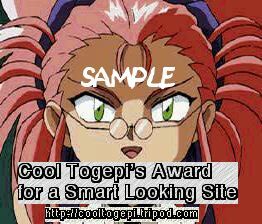 NOTE:Cool Togepi design and content � of CoolTogepi.tripod.com 2002. This site in no way is affiliated with Nintendo, Cartoon Network, or any other companies mentioned in it. I am not trying to infringe on any copyrights in anyway. This site is not associated with Nintendo, Wizards of the Coast, or Cartoon Network. This is merely a fan site.